Emma Young converted the family barn into a print shop. When most guests sit down to a dinner at Beetlebung Farm in Chilmark, they usually glance at the menu and then set it down again, absentmindedly imprinting it with grease and wine stains. But the more discerning will notice that the seemingly disposable item is actually a work of art — the design is innovative, the words have been selected for sound and form, and the ink has been elegantly fused with the paper. If one inquires who made this beautiful menu, the server, Emma Young, will answer, “I did.” Miss Young would have also picked the kale that very day for the quail egg and kale meal, and in between the morning harvest and the evening meal, designed, edited and printed the menu. Miss Young, 26, has been working as a professional typesetter and printer for about one year, but she’s been studying the art for several years. She spends hours preparing the Beetlebung menus. 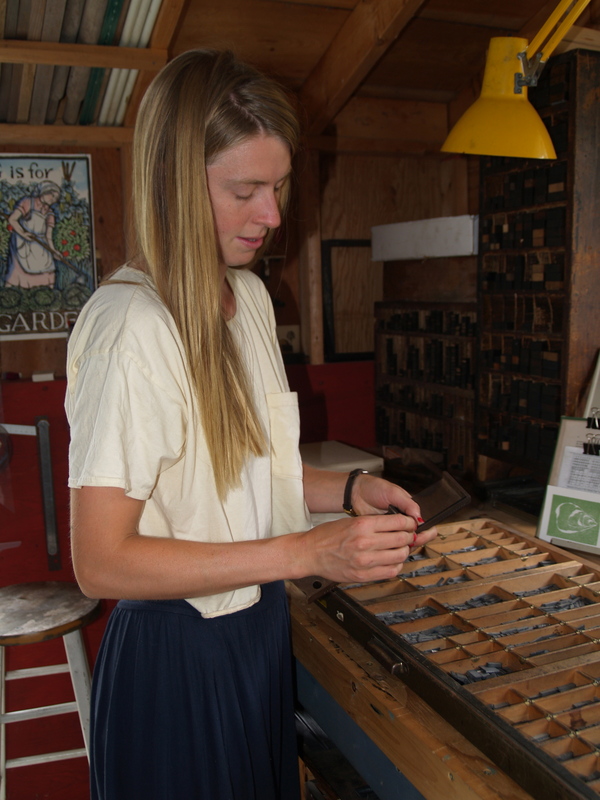 In her small, light-filled studio located in West Tisbury, Miss Young sets each word letter by letter. Once she’s finished the design, she places the type onto the press between wooden blocks called furniture. 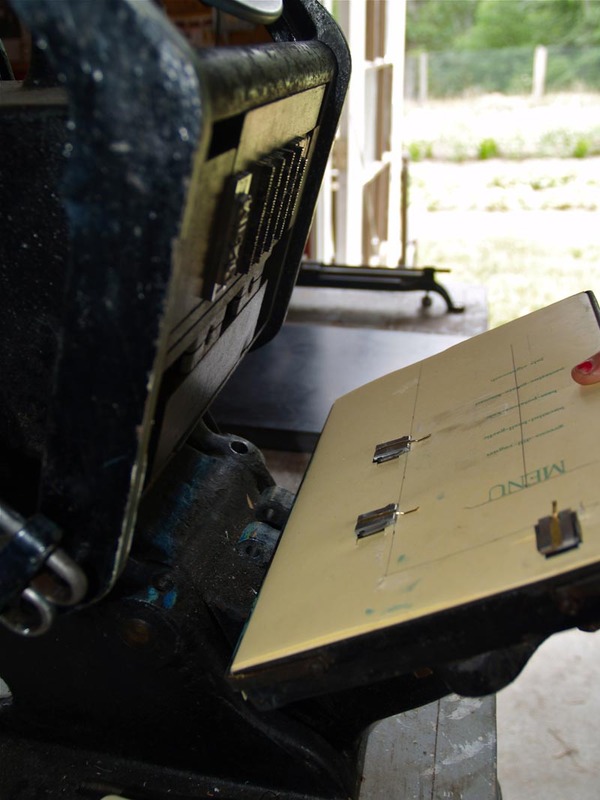 The platen, a rectangular metal tray, lifts the paper to the ink in rhythmic motions. The machines are hand-or-foot-automated, requiring repetitive hand or foot strokes to propel momentum of the flywheel. Sometimes the ink is printed unevenly, making the edge of a letter lighter in color than the rest. Ms. Young said her customers appreciate any evidence that the prints are made by hand. Miss Young purchased her first press, a late 19th century Sigwalt 5, in early spring of 2011, and began turning her family’s barn into a studio. Soon after, she acquired an additional typesetter, a floor model press called Kelsey Star 7x11, also late 19th century, from neighbor Edward Child, 92. After replacing the parts, she gave it a thorough nine-hour cleaning with a toothbrush. Miss Young said that poetry was her door into the art of letterpress. Her poems become finished when they take on a visual form, she said. In the winter, when she has more time, she goes back and edits her poems, and binds them into books to share with family and friends. Miss Young grew up on the Vineyard and attended Hampshire College in Amherst, Massachusetts. 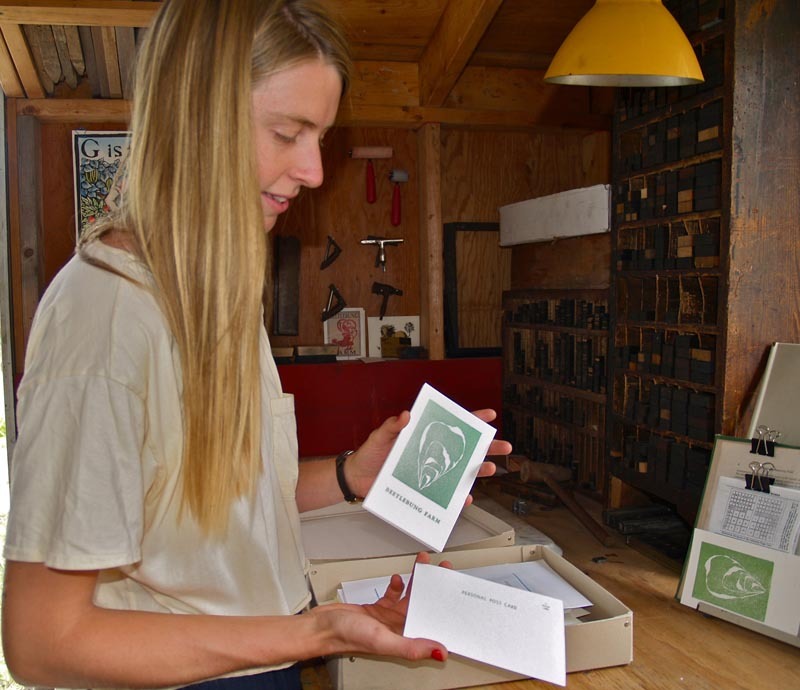 She studied letterpress at nearby Smith College, and her senior thesis combined the study of modern European poetry with the skill of printmaking. She did research to uncover and reproduce the original letters of 20th century poets like Ezra Pound and Vladimir Mayakovsky, who had worked closely with typesetters to enhance the visual representation of the poem on the page. After college she returned to the Island and during her first two winters worked as a librarian in Aquinnah and West Tisbury. This year she hopes to dedicate more time to printing. She compares the relationship between poet and typesetter to her relationship with Chris Fischer at Beetlebung Farm. 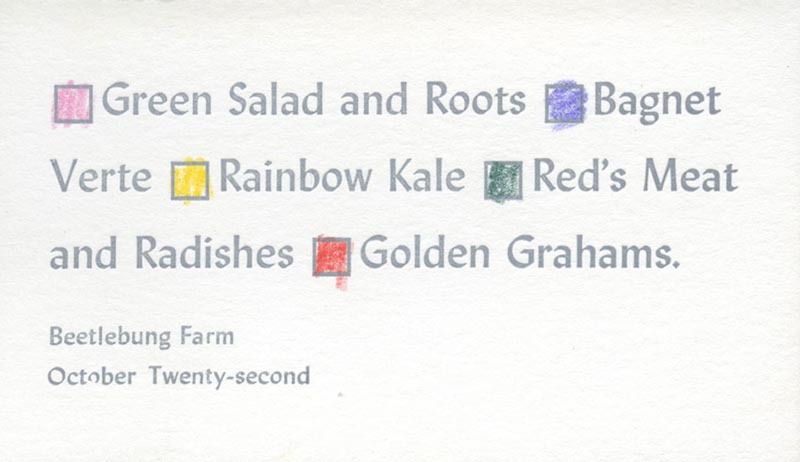 “I take a food poem and I create a visual and a graphic, [hoping] that the way the wording falls on the page is both appetizing and its own creative poem,” she said. 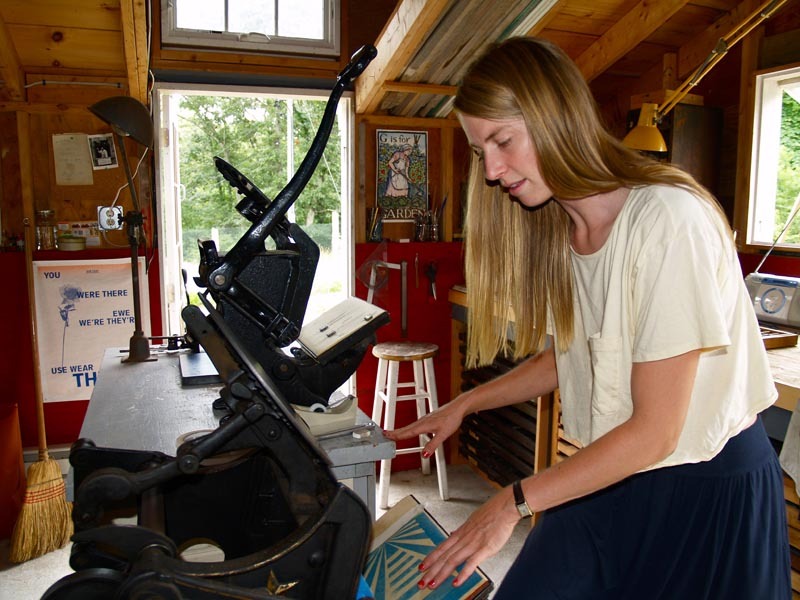 I love this story, but I'm a little surprised that the reporter didn't mention Dan Waters of Indian Hill Press in West Tisbury, who's been combining poetry, letterpress, and graphics (especially linoleum-block prints)for many years. The omission is all the more odd given Dan's long association with the Gazette.